In our house, summer shows up with a bang, and for a few months, our days are changed. We plan our weekdays around sidewalk chalk and our weekends around trips to the lake. Afternoons are spent in wet bathing suits and bare feet, and the smells of charcoal fires and fresh cut grass abound. Even our freezer changes, filling up with blueberries that we’ve picked, fish that we’ve caught, and frozen treats like the Samoa ice cream that I’m sharing with you all today. Summertime comes every year at no surprise, yet I’m always taken back by how much I’ve missed it. By how good it feels to thaw my bones. Sure, in a few weeks, I’ll beg for an autumn breeze. I’ll wish away the heat and the sweat. I’ll long for chunky sweaters and curse my jean shorts for forcing me to shave my legs one more time. But for now, I’ll enjoy the glow. I’ll take in all the barbecues and salty-skinned babies and Jimmy Buffet sounds that these days have to offer, because I know we need this season. Our family needs the lazy, chill pace that summer calls for. I’m sure your days may look different. Maybe you’re traveling abroad or camping. Maybe you’re stuck inside the four walls of an office. Maybe you’re home-bound with a new baby or spending your hours studying for summer school courses and exams. Wherever you find yourself this summer, I hope that you’ll spend a few moments taking it in. Do something worth writing home about, even if that something is nothing at all. And if you find yourself unsure of what to make of your time, consider making ice cream. 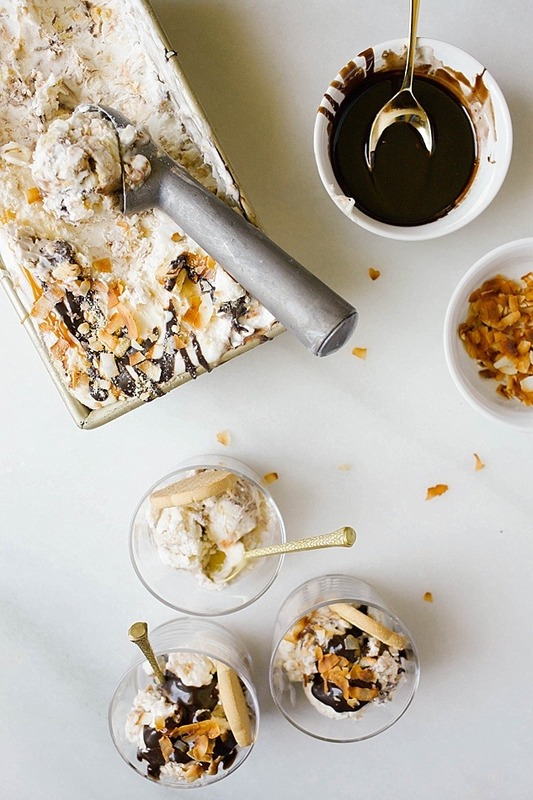 Specifically, this no-churn Samoa ice cream. 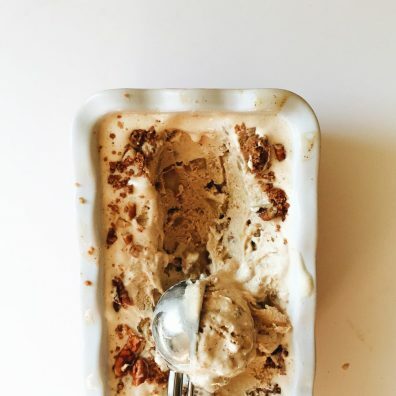 The idea of this ice cream came from a lone box of Girl Scout Cookies that Brett had stashed in the freezer. For weeks, he would pass over slices of cake and cups of homemade butterscotch pudding for one or two frozen cookies. Infuriating. 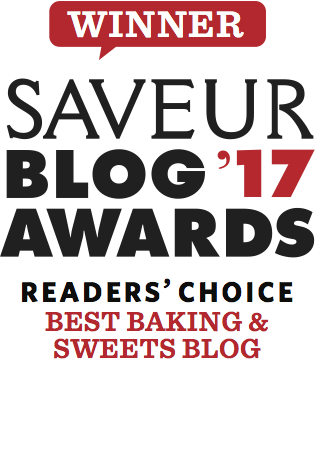 I was not going to let my desserts, the product of my blood, sweat, and tears be passed over for some pre-packaged, commercially-prepared snacks. Ok, ok, that’s being dramatic, I know. Girl Scout cookies are the best. I’m sorry for even bringing it up. But still. I was determined to win him over with Girl Scout Cookie inspired ice cream. And so Samoa ice cream was born. This ice cream is one of those super Kate-ish type recipes where you can make this as from-scratch or as semi-homemade as you want. I love doing it the long, homemade way, but I totally get that not every one of you feels that way. So, to make things simple, I’m going to break this recipe down for you so that you can do you. You can make this however ya please, cool? 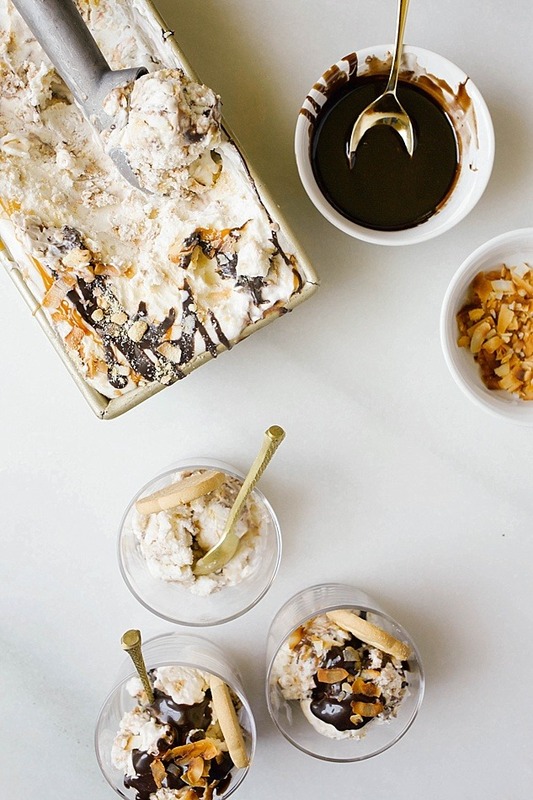 To prepare this Samoa ice cream, we start by making a no-churn coconut base. 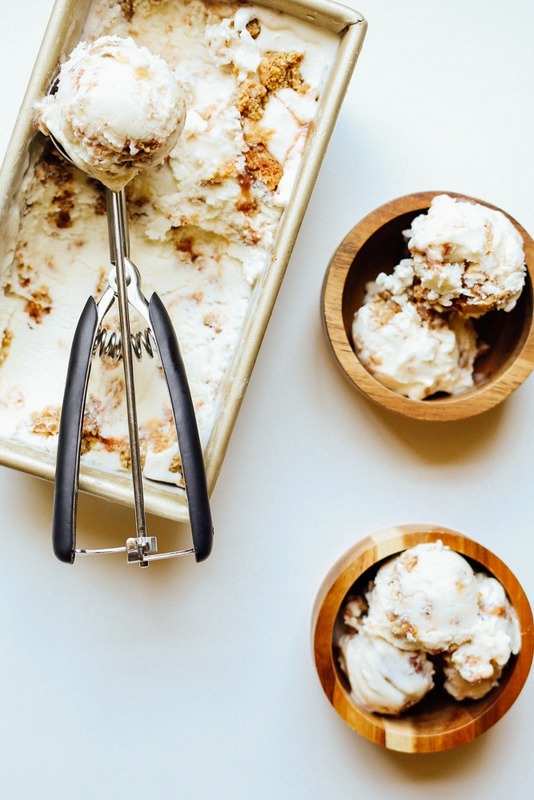 Like all no-churn ice cream, this starts with a little whipped cream, but here, we amp up the coconutty flavor by trading out the sweetened condensed milk for a can of cream of coconut. Sidenote: this is not the same thing as coconut cream. This is not the same thing as coconut milk. This is cream of coconut, okay? Don’t make the mistake of buying the wrong thing. I use this brand, but you can use whichever kind works best for you. Next, we add in a few mix-ins. 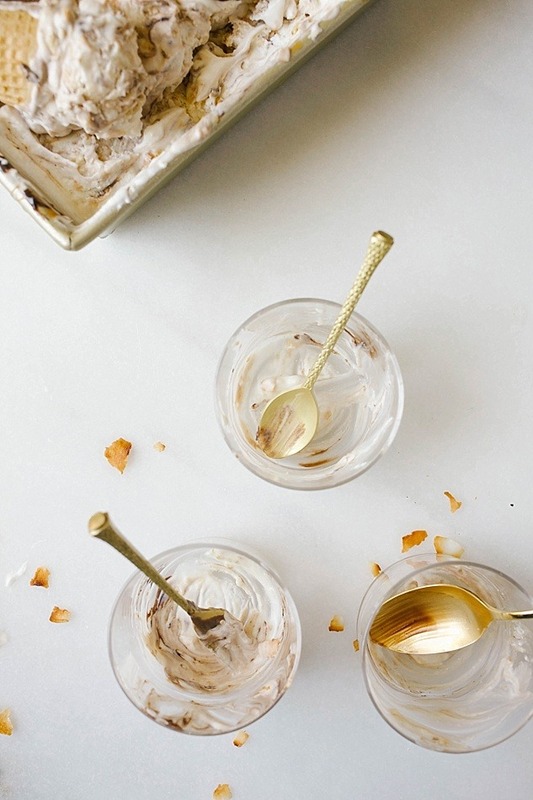 True to the Girl Scout cookie, I added toasted coconut flakes and crumbled store-bought shortbread cookies. Once all of that is folded in with the coconut ice cream base, we layer in a few more toppings- salted caramel and chocolate fudge sauce. Here, you can sub in some high quality store-bought varieties if you please, but in case you’re wondering, I make this caramel and this fudge sauce. 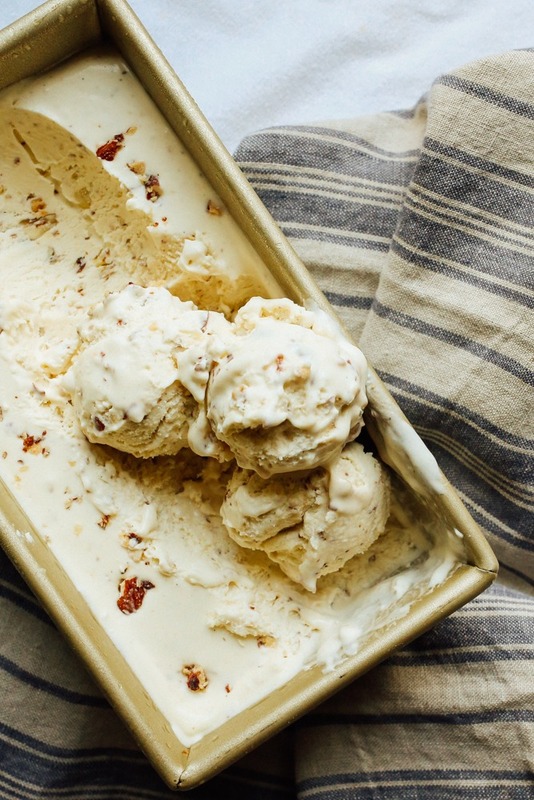 This ice cream won’t use the entire yield of those two recipes, so now you have a little bit of caramel and fudge to store in your fridge for a rainy day. Lucky you! Might I suggest using your caramel to make this chocolate caramel crumble cake or this salty caramel peanut butter pie? 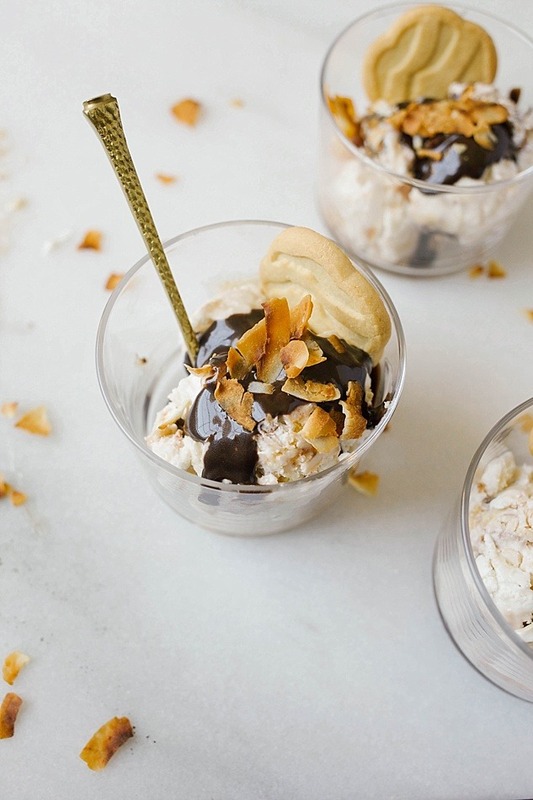 Once completed, this Samoa ice cream is a no-churn coconut ice cream filled with shards of toasted coconut, swirls of salty caramel and rich chocolate fudge sauce, and crunchy bits of shortbread cookies. After a brief stint in the freezer to firm up, the ice cream is sweet, salty, and altogether a flavorful, frozen experience that is deeply reminiscent of the Girl Scout cookies we all know and love. This is a brilliant way to celebrate those campfire treats and to savor that baked flavor even through the warmest of months. And since you’re dying to know, I’ll tell you that Brett tried the ice cream, loved it, and then promptly continued eating the original cookies from the freezer. Men. Am I right? 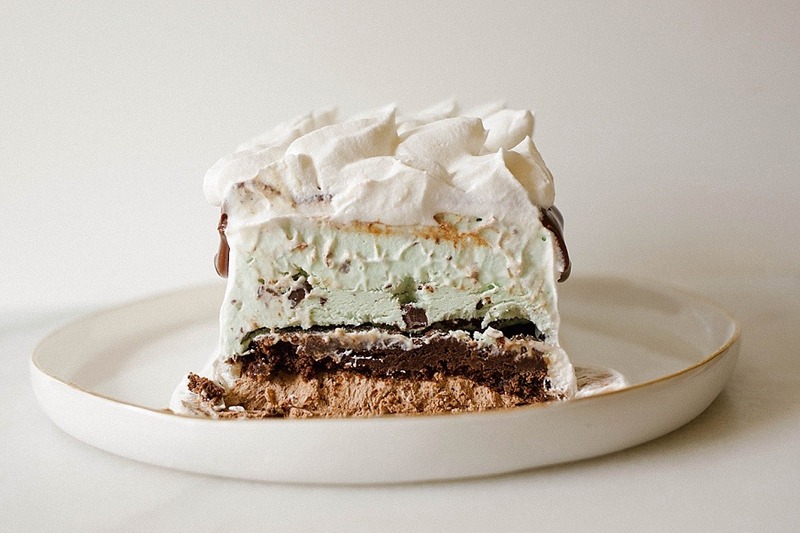 When planning out your summer months, I hope you’ll carve out space to make and enjoy this Samoa ice cream. 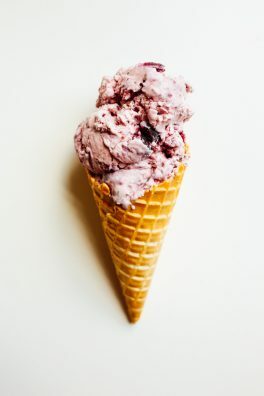 Nothing says summer like an ice cream cone, and once you try one filled with this frozen dream, I think you’ll agree. Happy summer to you all and much love from our family to yours. Cheers! 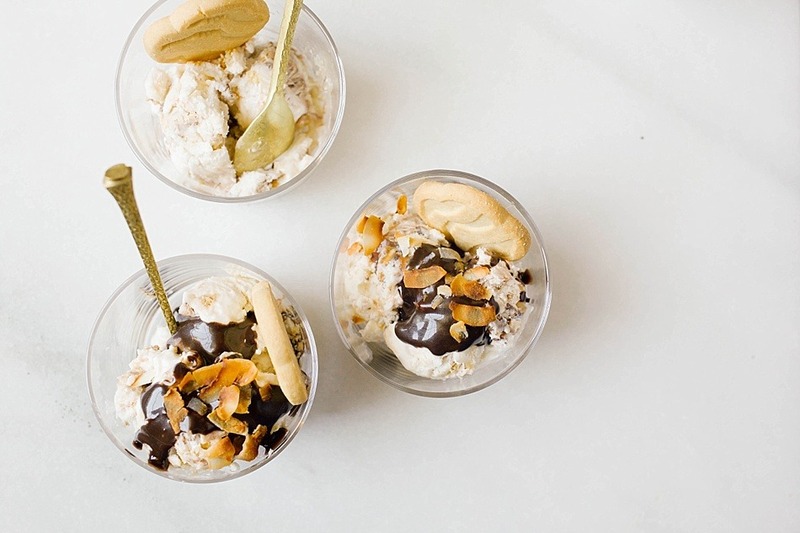 This Samoa ice cream is a no-churn coconut ice cream filled with toasted coconut, swirls of caramel and fudge sauce, and bits of shortbread cookies. 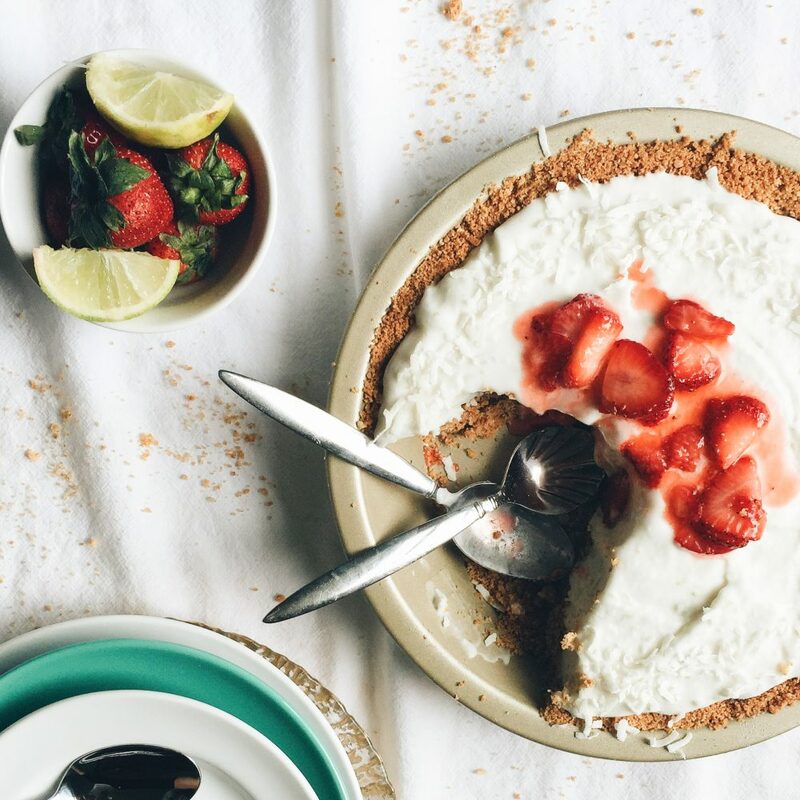 In the bowl of a stand mixer or in a large mixing bowl, beat the whipping cream on low speed until it becomes frothy. Increase the speed to high and beat until stiff peaks form. Once whipped, fold in the cream of coconut until well combined. (Sidenote: If the cream of coconut has large solid clumps in it when you open the can, you can immerse most of the can in a bowl of hot water and then stir it vigorously until the clumps melt.) Fold in the crumbled shortbread cookies and coconut. Spread about ¼ of the ice cream mixture into a large, quart sized freezer safe container (I use a metal loaf pan). Drizzle in ¼ of the caramel and fudge sauce and then swirl it in slightly by dragging a butter knife or spoon through the ice cream mixture a time or two. 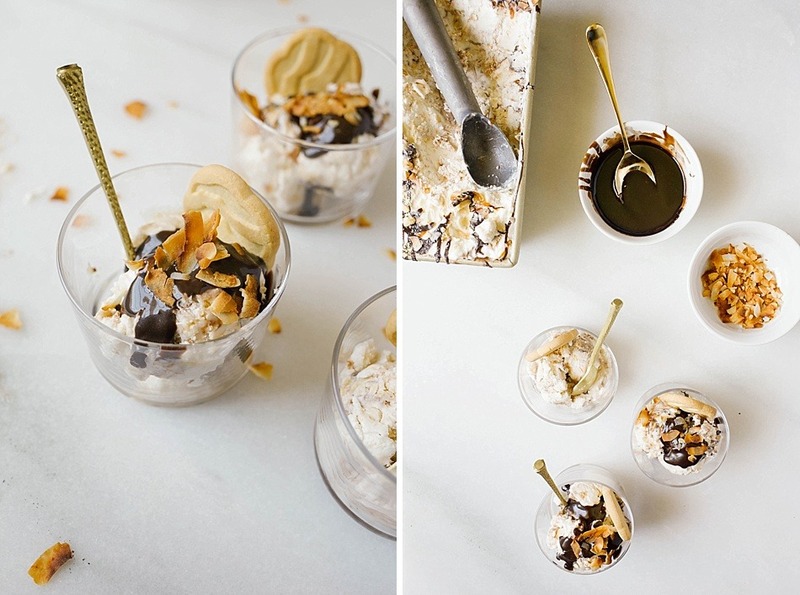 Repeat this process 3 times until all of the ice cream, caramel, and fudge sauce has been used. Cover with plastic wrap or foil and allow to set up in the freezer until frozen, about 6 hours or overnight. Ice cream will keep in the freezer if covered for about 2 weeks. To toast shredded coconut, spread coconut out on a baking sheet and cook in a 350 degree oven, tossing occasionally, until golden brown. This will take anywhere from 5-10 minutes depending on the oven. Do not let burn. Once toasted, remove from pan to cool. I used Girl Scout shortbread cookies, but you can use any brand (or even homemade!) vanilla shortbread. In a pinch, vanilla wafers would work as well. I keep a jar of caramel sauce in my fridge to add to recipes like this. I prefer Bobby Flay’s recipe for salted caramel (see blog post for link), but any variety of caramel sauce that you enjoy eating would be fine here. Silly Brett! He’ll be coming back for sure once all his cookies are gone! This looks amazing Kate. Can’t wait to get it on my ice cream making list this summer! Agh! I love it! Don’t you love those kind of happy packages??? 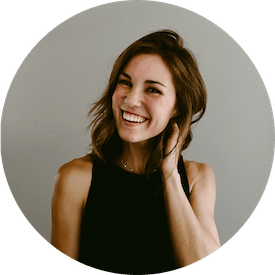 Oh goodness I agree with you–summer is so necessary but I quickly find myself anticipating boot and sweater weather once it arrives. 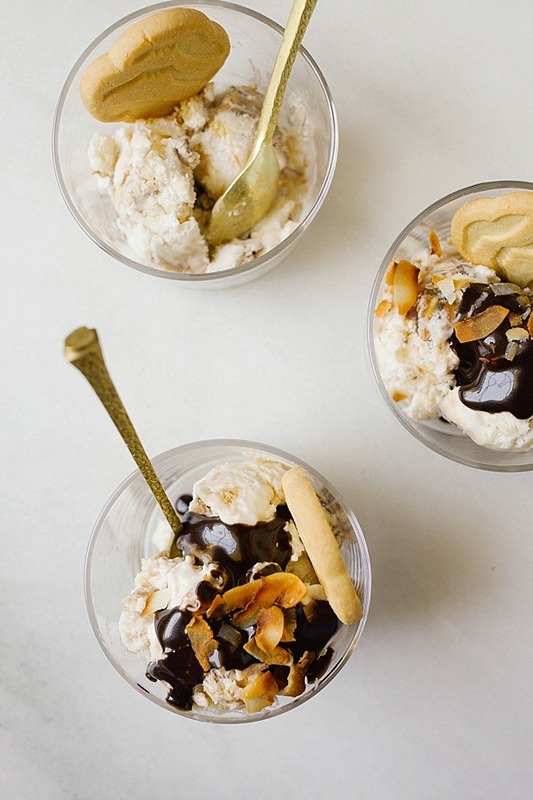 This ice cream looks like the perfect way to celebrate the gorgeous warm weather! Yummmm! 100% down to trade. Cute post! 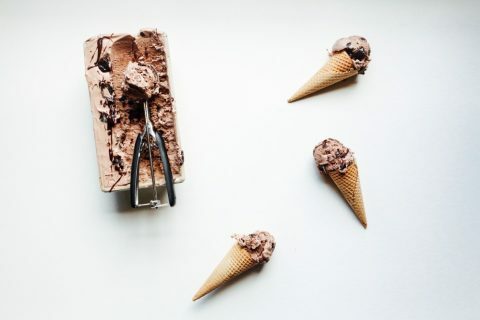 And the ice cream looks delicious! Can’t wait to make this recipe! Happy summer! 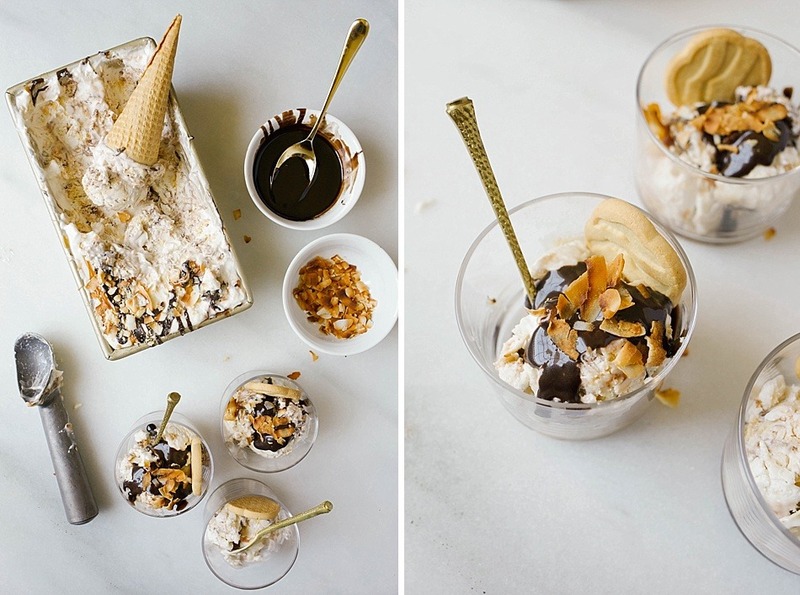 Lovely pictures and the ice cream look so yummy!